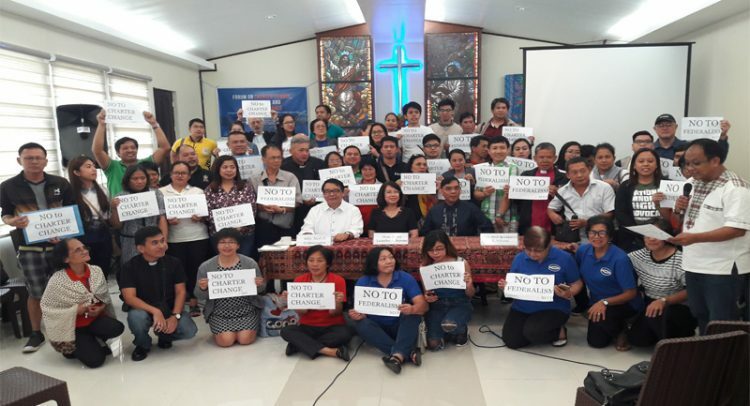 We, the representatives of the thirteen (13) Regional Ecumenical Councils (REC’s)* from all over the country, are gravely alarmed by the Duterte government’s move to change the 1987 Philippine Constitution for federalism. Certainly, there is no popular clamor for it; recent surveys show that there is an increasing number of Filipinos opposed to charter change. We are deeply concerned that the proponents of the charter change have a misconstrued understanding of development that will benefit only a select few. It seeks to allow foreign businesses to own larger shares of various ventures that were safeguarded by our present Charter. It can also expand and strengthen the power of political dynasties and constrict the democratic space in our society further. This move to shift the form of government will push our people further into the margins as more taxes will be imposed on the people to support new structures and officials. *“RECs” are ecumenical fellowships of churches of different denominations in the provinces and regions committed to following Jesus Christ by working together for common prophetic witness and service in responding to the people’s issues specifically justice and peace, human dignity and rights, and the integrity of creation.